Combine the oil, vinegar, sea salt and garlic. Stir to blend, add the beans, toss and set aside. Bring 1 quart of water to a boil, add the pasta and cook over a medium flame for 4 to 6 minutes until done. Place in a strainer, rinse and drain. 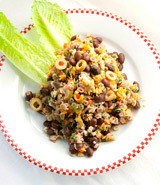 Toss the pasta with the beans, olives and parsley. Adjust the seasoning with extra vinegar and/or sea salt, if needed. Serve room temperature or chilled.